It sounds a lot like the divide between “Best Foods” and “Hellman’s” mayonnaise. “Known as Best Foods west of the Rockies” has been their watchword since, oh, I’d guess the 1930’s. Oddly enough, the recipes for the mayonnaise are _slightly_ different, apparently tailored to local tastes. Some people are picky enough, they buy several jars of the “other” mayonnaise when they go visiting across the continental divide. You’ve got to admire the fact that the company website is mayo.com! 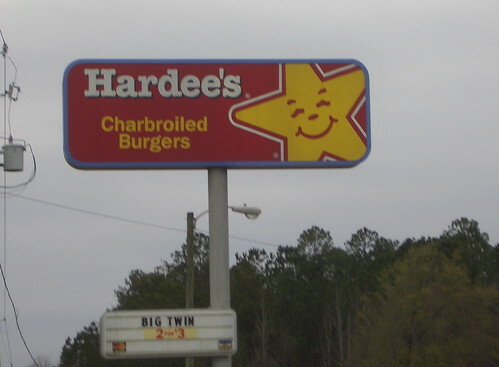 The Hardees, as you no doubt found out, is on the southeast corner of 38th Ave and “The Highway” (as the taxi drivers call it, to avoid the numeric confusion between 34th St. and US 19). We don’t get Paris Hilton, though. Ok so im a San Diego boy and when I took a trip to Helena montana, i thought i was crazy when i saw a “hardees” commercial. I for some reason remember a carls jr in Gila Bend AZ on that same trip cuz we went through flagstaff then got onto the 15 in utah. But on my more recent trip when we drove through Gila Bend this time, there was no Carls jr in Gila Bend. I know Gila bend is puny, and there are like 100 people in the world who have heard of it, does anybody know what happened to this amazing restaraunt???????? Previous Previous post: Electricity by Amazon?